The Blog of Jared Kirk: 4 Marks of Pride: Could You Be Secretly Prideful? 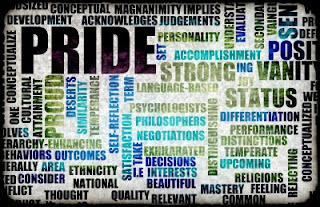 4 Marks of Pride: Could You Be Secretly Prideful? According to Christianity pride is the first among sins. By it and through it all other sin comes, because one must first say to God, "no thanks" before sin has a foothold in your life. But the problem with pride is knowing that you are prideful. So with thanks to Pope Gregory (c.540 AD) here are the four marks of pride, along with my own modern interpretations. When you think, "my financial success is due to my hard work and strong intellect. I built this with my own two hands." This is true. But it is also true, that God made you smart. Did you make you smart? And it's also true that God has given you health. Try working hard without your health. Everything you have is a gift, but it is so easy to forget. There is an old-school name for this, "Pelagianism." It means that you have done all this moral and religious work and now you expect God to bless you for it. In this scenario, God is not your savior, you are your own savior because you have just been so darn good that you feel God has to bless you. This is why so many religious people are incredibly prideful. They fall into this trap. Do you? Or do you recognize that God blesses and gives freely and then live morally and religiously in response to his free gifts? Ever met someone who was convinced that they had a great sense of humor, but only told the same three lame jokes over and over again? "A piece of string walks into a bar..." Yeah. Pride is difficult to spot in yourself. I love the examples that Peter Kreeft gives concerning this in Back to Virtue. He mentions claiming to be "well-integrated, mature," or possess an "adult personality." Because the human tendency is to be blinded and say, "I would never boast of having what I don't have!" Again thanks to Peter Kreeft who points out that one of the most common instances of this in today's society is to despise "simple, unprogressive people" and to believe that you alone are the possessor of wisdom and tolerance. Yet this is the depth of pride. You reject people who don't fit your definition of open-minded and become as rigid in your categories as those who you despise. The religious version of this is just as insidious. Do you think, O Christian, that you have the corner on truth and morality? You will be shocked to learn that many of your secular friends and neighbors are better people than you who may instruct you in how to live wisely.